Alternaria is a large genus that belongs to phylum Ascomycota (Sac fungi). A majority of Alternaria species are saprobic, which means that they are largely involved in the decomposition of various organic matter. As such, a good majority of these species can be found in environments with organic material and water (or moisture). Some of the species however are endophytic (they live in various parts of crops including seeds and fruits etc) and pathogenic, causing disease in animals. Whereas pathogenic species cause animal diseases such as hypersensitivity pneumonitis in man, endophytic have been associated with the damage of crops as is the case with the Alternaria rot of mangoes. Today, well over 100 species of this genus have been identified. However, they are yet to be well understood. For this reason, nomenclature confusion is common. In most cases, the size of the conidia as well as its shape is used to determine the different species. Such aspects as the sporulation pattern and properties of the mycotoxins produced are proving to be important in the identification of these species as well. A. alternata is one of the most popular species of genus Alternaria. It can be found in soil, as a saprophyte, in plants where it causes diseases as well as a pathogen (during its pathogenesis phase) where it can cause animal diseases by producing various toxic substances. As such, it is the best species in order to learn about the various characteristics of this genus. When grown in culture, Alternaria alternata has been shown to develop and grow as elongated chains with conidiophores that are dark brown in color. 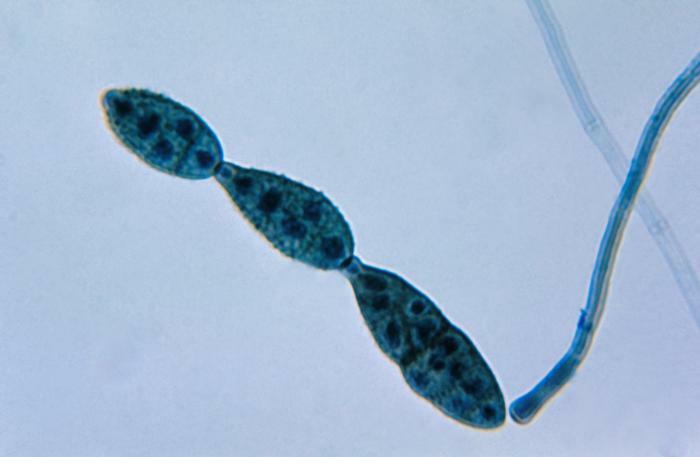 In favorable conditions (moisture or rain, nutrition), spores, referred to as conidia are produced (growing as buds from the conidiophores) from the conidiophores asexually. Under the microscope, these spores will appear larger in size with a dark appearance. 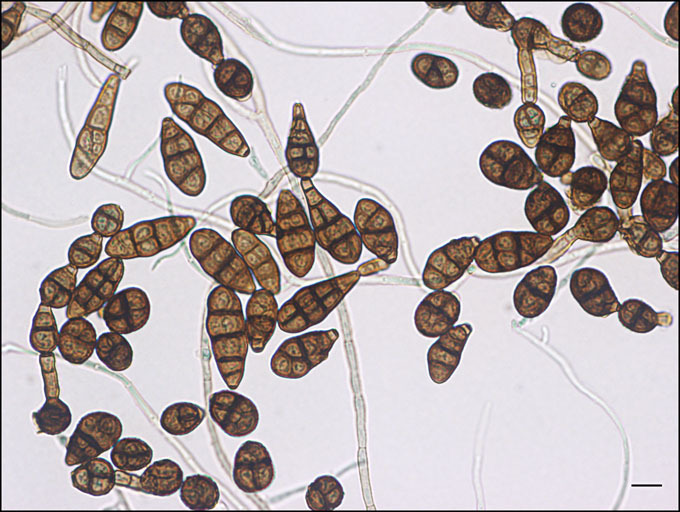 Compared to the spores produced by A. solani, the conidia of A. alternata have been shown to have shorter beaks and a fine longer septa. Depending on the environment, the conidia are dispersed differently. For instance, some of the conidia may be dispersed by being spread by wind or transported by water. 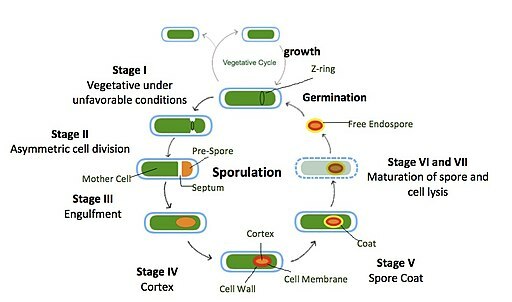 Once they land on a suitable substrate or parts of a plant (leaves, fruit, seed etc) the spores begin to germinate in the presence of moisture and ideal temperature range. Here, they again grow as elongate chains and with continued favorable conditions, start producing spores from the tip of their hyphae for the cycle to continue. Once dispersed, these spores can land on plant leaves where they start germinating. As they continue to germinate on leaves, particularly the edge of young leaves; they cause necrosis and chlorosis as they develop while utilizing nutrients from the leaves. These lesions can also be seen in the fruits of a plant. As the fungi continue to grow and reproduce, it can spread to the leaves of other plants, affecting all plants in the area. With such plants as mangoes, this fungi has been shown to Alternaria rot, where the organism penetrates the fruit through the lenticels and spreads within the fruit. This can spread to other fruits causing damage (darkening of the fruit's interior) and can greatly cost farmers. With fruits in particular, Alternaria grows rapidly given that fruits provide favorable conditions for growth; moisture and nutrients required for growth and reproduction. Given that this genus of fungi is still not well defined, researchers are looking towards the toxins they produce as one way of effectively identifying them. Whereas most of the species in the genus produce various types of metabolites (phytotoxins) some like A. alternata are capable of producing mycotoxins that spoil a variety of crops. In the crops/plants they infect, Alternaria species can produce high amounts of these toxins, which ultimately cause diseases in plants. Studies have shown various species of this genus cause various cutaneous and subcutaneous infections in people. Here, cutaneous infections are infections that affect the skin (such as skin lesions) while subcutaneous are infections that occur under the skin as the organism penetrate the skin thereby causing localized infections- a majority of infections are on the skin surface. These infections not only affect the skin, but also other parts of the body including the nails (onychomycosis) various sinuses (rhinosinusitis) and the cornea resulting in visual impairment (oculomycosis). However, in most cases, these infections are common among individuals with compromised immunity. For this reason, the infections are regarded as opportunistic infections. * For human beings, infections caused by mycotoxins are known as mycotoxicoses. While they are rare, research has shown such infections to exist. Effects of these mycotoxins on human beings range from mild to chronic infections; however, this is largely dependent on the immune response of the individual. 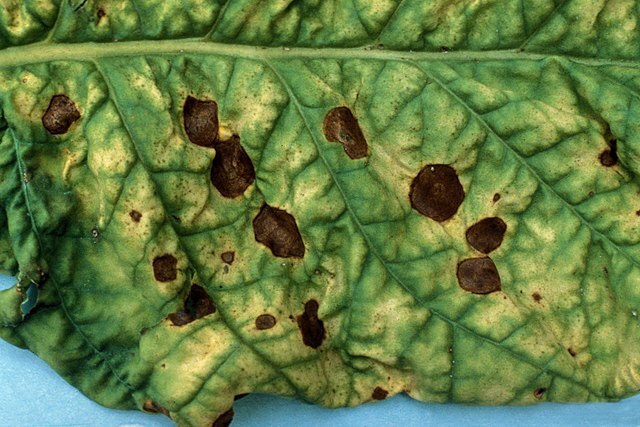 However, this also depends on the type of alternaria. Antonio Moretti and Michele Solfrizzo. Alternaria toxins and plant diseases: An overview of origin, occurrence and risks. World Mycotoxin Journal · May 2009. Bart P. H. J. Thomma. Pathogen profile Alternaria spp. : from general saprophyte to specific parasite. MOLECULAR PLANT PATHOLOGY (2003) 4(4), 225–236. F. J. Pastor and J. Guarro. Alternaria infections: laboratory diagnosis and relevant clinical features. Clin Microbiol Infect 2008; 14: 734–746. Michael J. Carlile, Sarah C. Watkinson, Graham W. Gooday. The Fungi. 2003.